The 65 Touch'N Flow PRO Trigger Valve and the 170 Water Breaker Sprayer. 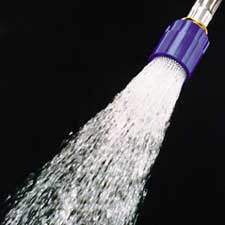 The 65 now offers double the flow - 11 gpm at 40 psi, and greatly increased durability, comfort and heavy duty all day use. Cushion grip, one-touch lever activated valve. Simply squeeze the valve to turn on water flow, and let go of the trigger to stop water flow. Will fit a standard water hose or BathMaster System. The Touch'N Flow has been completely reengineered for true professional use. It's durability and ease of use makes this item a must have. Groomers everywhere asked for a more durable, full-flow trigger valve. The 65 Touch'N Flow PRO Valve is the result of those requests.